60 acres located off Zangle Road, near Capitol Land Trust’s Bayfield Resources Company Forest Conservation Easement in northern Thurston County. The Lonseth Preserve is almost entirely composed of wetland and associated wetland riparian forest, with second-growth forests roughly 65 years old. The property is part of a larger initiative, the Budd to Henderson Coastal Conservation Initiative. The goal is to create an overland corridor to connect the Gull Harbor estuary on Budd Inlet and the Woodard Bay estuary on Henderson Inlet. In November 2011, Capitol Land Trust purchased the Lonseth property, a 60-acre parcel on the peninsula north of Olympia between Budd Inlet and Henderson Inlet. Purchase of this property is part of a larger strategic plan, the Budd to Henderson Coastal Conservation Initiative, which began in 2005 and has already conserved a majority of the Gull Harbor estuary, the most naturally intact estuary within the Budd Inlet watershed. The long-term goal of the initiative is to establish a protected overland corridor between Gull Harbor to the west and the Woodard Bay/Chapman Cove estuarine complex on Henderson Inlet, to the east. The Lonseth property is a rectangle at the north end of the project area boundary. The site contains important forested and open-water wetlands that drain to both the Woodard Bay Natural Resource Conservation Area and into Gull Harbor. While it’s unlikely that aquatic organisms could purposefully or in some serendipitous manner make the overland passage between the two inlets, creation of an overland corridor for mammals and birds offers an intriguing metaphor for the connections and links Capitol Land Trust makes—connections that allow natural functions to proceed and evolve in a healthy and vital, though not always predictable, manner. Looking at a map, it is easy to imagine the free movement of land creatures along the corridor between Gull Harbor and Woodard Bay, unimpeded by major human interference. Only two main roads cross this corridor—Boston Harbor Road and Libby Road. This lowland landscape looks remarkably similar to the way it was after the retreat of the ice-age glaciers that scoured the region thousands of years ago. The geology of the property is entirely glacial silt, mostly Vashon till, which was deposited when glacial fingers of the western ice sheet reached their southern limit in what is now the southern Puget Sound region. The property’s habitat appears to support a number of important species including bald eagle, great blue heron, pileated woodpecker, and purple martin. Red-tailed hawk, bufflehead, mallard, common goldeneye, surf scoter, cormorant, Yuma myotis, black-tailed deer, raccoon, Canada goose, Harlequin duck, kingfisher, turkey vulture, weasel, frogs and salamanders have also been seen. Vegetation on the property consists of upland forest, riparian habitat, and a variety of wetland habitats. Douglas-fir is the primary tree species. 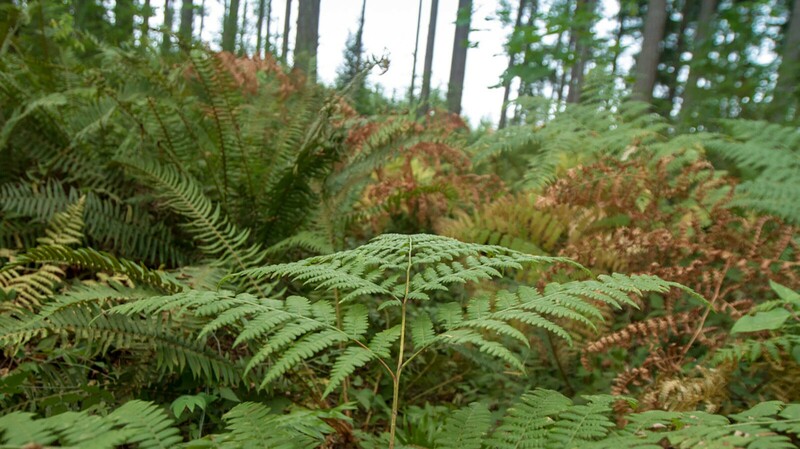 The forest understory is dominated by salal, sword fern, Oregon grape, and several varieties of huckleberry, with smaller amounts of oceanspray, salmonberry, red elderberry, and Indian plum scattered throughout. Along the open water wetland/riparian fringe and in the forested wetlands, common plant species include red alder, Indian plum, spirea, creeping buttercup, slough sedge, Arctic sweet coltsfoot, giant horsetail, lady fern, devil’s club, red-flowering currant, maidenhair fern, large-leaved avens, swamp rose, and salmonberry. The Lonseth family managed the property for sustainable timber production from 1967 until Capitol Land Trust purchased the property. Salvage, thinning and replanting activities have been carried out intermittently on parcels of the family’s tree farm since 1991. Capitol Land Trust’s overall timber management goal for this property is to maintain forest health and achieve old-growth forest characteristics with well spaced, large-diameter climax species such as Douglas fir and Western redcedar with an open forest floor dominated by red and evergreen huckleberries, sword and bracken ferns, salal, and Oregon grape. The Land Trust is evaluating management strategies to achieve this goal. The Lonseth acquisition and the larger Budd to Henderson Conservation Initiative provide an excellent opportunity to preserve intact habitat that no longer exists in much of the southern Puget Sound region. The project will help to permanently conserve an important landscape-scale riparian habitat system, including freshwater streams, seeps, springs, forested wetlands, and Puget Sound’s coastal shorelines, safeguarding water quality and flow into Budd and Henderson Inlets. Thank You Project Partners: Squaxin Island Tribe, U.S. Environmental Protection Agency, WA State Department of Natural Resources, LOTT Clean Water Alliance, WA State Recreation and Conservation Office, WA State Salmon Recovery Funding Board, Thurston County, Wild Fish Conservancy, Washington State University, Forterra (Cascade Land Conservancy), Bayfield Resources Company, The Cushman family, Elizabeth and Stan Lonseth.